Campuses, organizations, and communities are transformed through Ziger|Snead Architects’ mission that great design can change people and places and have a positive social footprint. Clients value the firm’s dedication to a distilled design approach, focus on relationships, and active community engagement. Its projects have been recognized with more than 100 local, state, national, and international awards for design excellence. 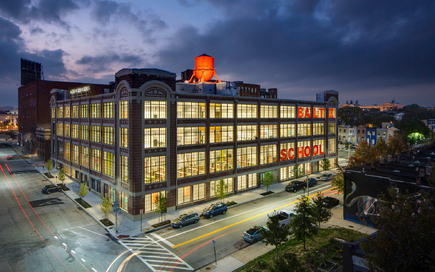 As a small business, the studio holds its own amongst large firms and is included as one of the Top 50 Architects in the nation by ARCHITECT magazine, the publication of the American Institute of Architects. Ziger|Snead's design approach is driven by a thoughtful analysis and creative synthesis of client goals, programmatic needs, and site context and constraints. A clear driving concept for each project is developed through an engaged dialogue in which methods and strategies are put forward and refined in an iterative and open process. At every stage, each element of the design is refined to support the central idea. This design approach strives for simple, elegant, distilled design; subtractive rather than additive. The results are characterized by a formal restraint, a poetic use of materials, and a desire to enhance the experience of those who engage with the work. Sustainability is inherent in this efficient and integrated approach to design. Rooted in a deep understanding of Baltimore’s ethos, history, promise, and challenges, Ziger/Snead's work is a search for authenticity and celebration of place. Ziger|Snead embraces its client's missions to strengthen communities; it is at the core of our mission as a design firm and resounds through our community involvement, charitable contributions, pro-bono work, and focus on the advancement of design education. Realizing that nonprofits are often the glue that binds a community together, Ziger|Snead's work strives to further the interconnected missions of its clients through architectural design. The studio's focus on non-profit and institutional clients aligns with the founder’s deeply held beliefs in the architect’s moral responsibility to improve the lives of others. Constraints inform Ziger|Snead’s work as much as do aspirations to enhance communities and deliver design of the highest standard. The studio takes great pride in providing dignified solutions to complex problems within very low-cost budgets and the realities of working within existing buildings and infrastructure. It is our role as facilitator of the decision making process to work in a collaboratively manner with all project stakeholders, and to do so in a controlled manner that ensures consensus is gained, decisions are made, and the schedule is maintained. Ziger|Snead facilitates engaging and productive discourse, asks relevant questions, listens carefully, and truly values the collaborative process with institutional and board committees and active neighborhood groups. We seek clients who value what we offer – curious people who are interested in creating a positive impact and have a faith in architecture’s capacity to improve our environment. In the earliest stages of a project we frequently find ourselves in an advisory role. Whether guiding clients through site or building selection, putting together the right development team, or creating the vision to assist with fundraising, we’re preparing the project to meet the needs of the owner and maximize community support and financial success. From our experience, the most significant cost-saving decisions are made at this stage and projects succeed when there is consensus between all interested parties before design begins. Adaptively reusing and renovating existing buildings is one of the most sustainable approaches to designing new spaces because of the embodied energy in existing buildings. As the buildings in our cities and beyond age, we enjoy the challenge of repositioning them to meet today’s needs. Our years of experience provide us with understanding of how buildings age and how to assess the condition of materials, systems, and structure for new and potentially different uses. Our experience results in extremely accurate assessments of existing building conditions for renovations, additions, adaptive re-use, and historic preservation. The financial and functional success of a project most directly relates to the success and thoroughness of the program. Program and space needs are based on interviews with the building’s users, analysis of specific research and a full understanding and documentation of project needs and organizational goals. We work collaboratively with organizations to identify goals for: image and identity; function and space relationships; project costs, operation and maintenance; future flexibility and expansion; and long term energy usage and sustainability. Ziger|Snead prepares alternate scenarios for optimizing decisions, based on its thorough understanding and synthesis of client goals, space needs, code and budgetary constraints, and site opportunities. The process takes a long-term strategic and multi-disciplinary approach to the planning process by considering many variables that influence current and future opportunities. These include public and private incentives, operational and financial goals, market trends, environmental and infrastructure constraints, and others specific to each non-profit organization, developer or school. Our architectural services continue from Concept Design through Construction Administration. Through an integrated team approach to design, engineering, and construction, our projects optimize value relative to initial investment and long term environmental, economic, and social cost over the lifetime of a building. Design options are presented for evaluation of the relative merits of each option with respect to the clarity and quality of the concept, costs, feasibility, and overall program and design objectives. Quality architectural design must be supported by interior spaces that reflect the client’s image and culture and maintain appropriate levels of comfort, environmental sensitivity, durability, and engagement. We take great care in creating environments which enhance the experience of those who work, live, worship, and learn in them by providing inviting, comfortable, functional, and durable spaces with respect for individual needs and communal interaction. We believe design is about building responsibly and for the long term. This means integrating sustainable principles, using durable materials appropriately detailed, and thoughtfully using limited resources. Sustainable design is an asset to our integrated design process and we look beyond the specific requirements of LEED Certification to provide the end user with a facility that is energy-efficient, comfortable, healthy, and inspiring. 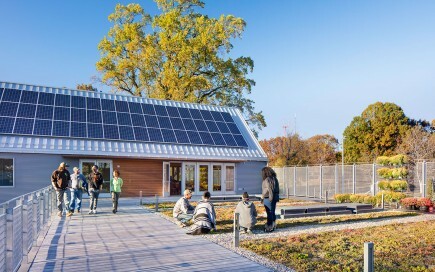 The studio was an early signer of the AIA 2030 Commitment which requires design standards that will result in net-zero building by 2030 and is currently ranked #25 on the Top 50 Firms in Sustainability by ARCHITECT Magazine. 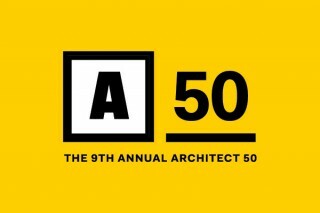 Ziger|Snead Architects on ARCHITECT Top 50 List Again | Ziger|Snead Architects is honored to be included in this prestigious group, ranking #25 in Sustainability, #46 in Design, and #119 in Business. 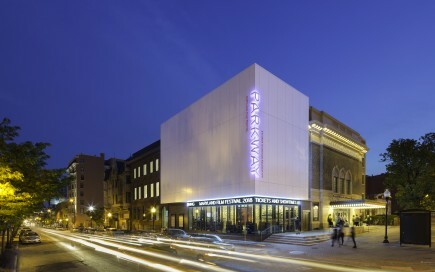 The transformation of the historic Parkway Theatre is an authentic, rich, vibrant “rescued ruin” that energizes the film complex and anchors its critical location in the heart of the Station North Arts District.